Woke up early this morning and had a brief Skype with Mom as she was up way too late. 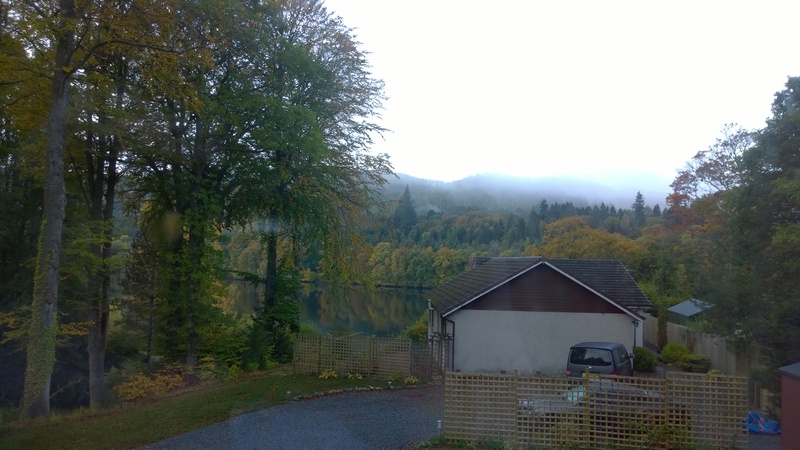 I captured a beautiful view of the light dawning over the loch next to the house. I eventually wandered downstairs to make myself some tea and eat breakfast. It’s so wonderful to be staying somewhere with a kitchen. Thanks Susan! Before too long, Candida and I were ready to hit the road. On today’s agenda was Culloden Battlefield and Clava Cairns. We also had plans to meet up with Lisa, one of the Inverness Outlanders I wasn’t able to meet last week. On the A9 north, we drove through periods of sun, clouds and mist—you know, typical Scottish weather whiplash. By the time we reached Culloden though, the weather seemed to have settled into a period of sun. It was however the coldest day of the trip so far.